The Twenty-First Judicial District Commission on Judicial Performance recommends by a vote of 10-0 that Judge Craig P. Henderson BE RETAINED. Judge Henderson is from Wiley, Colorado. He graduated from McPherson College and Washburn University Law School. Judge Henderson clerked for the Governor of Kansas during law school, worked in private practice, and worked in the Office of the District Attorney for the Thirteenth, Fourteenth, and Twenty-First Judicial Districts. Judge Henderson was appointed as a Mesa County Court Judge by Governor Owens in 2006. Judge Henderson was evaluated by the following methods: attorney surveys, non-attorney surveys, self-evaluation, courtroom observations by commission members, review of written decisions, and an interview with the Commission. Of all attorneys completing surveys, 72% recommended to retain, 20% not to retain and 9% made no recommendation. Of all non-attorneys completing surveys, 89% recommended to retain, 6% not to retain, and 5% made no recommendation. 88% of the survey respondents felt that Judge Henderson made appropriate sentencing decisions, compared to 63% appropriate sentencing rate for other County Judges statewide. The Commission was impressed with Judge Henderson’s efforts to improve the justice system. Over the past 5 years Judge Henderson has participated in and co-chaired a working group addressing evidence-based decision making and innovative new bond guidelines for defendants based on risk levels related to public safety and their flight risk. The outcomes have resulted in a more efficient use of jail space while better maintaining public safety. These reform efforts have received State and National recognition, including a 2015 Criminal Justice Innovations Award from the Association of Prosecuting Attorneys. Judge Henderson has also been very proactive in evaluating the efficiency of his courtroom and making improvements without diminishing his attention to each case individually. A concern mentioned in the attorney surveys was the Judge’s demeanor. The Judge is aware of the concern and is addressing it. 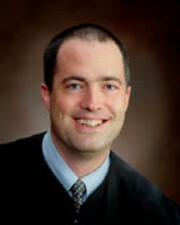 Overall, the surveys rated Judge Henderson as a good judge.